First up, thanks a lot for the masses of awesome messages you've left us.... firstly, for Luke joining Iced Earth with effect from June & secondly, for Chris & Martin with their new band project. Remember that Fury UK doesn't end it just goes on-hold until such time as Chris, Luke & Martin are available & ready to do something together again. Just click on the mp3 button below to get your free download of the "Taste The Blood" track. Bassist Luke Appleton joins Iced Earth. 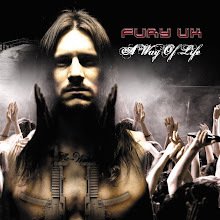 Fury UK announce free mp3 download. New project for Chris Appleton & Martin McNee. British metal band Fury UK proudly announces that bassist Luke Appleton is to join US metal powerhouse Iced Earth, with whom the band toured across Europe last winter. Luke replaces Freddie Vidales who has announced his intention to retire from Iced Earth after completion of the band's Chinese shows this April. The Cyprus show is being filmed & recorded for an upcoming DVD/CD release. "Having known for a week or two about Luke's fantastic opportunity with Iced Earth & in any case, always hungry to try something different, Martin & myself have laid plans for a new British metal band. The key difference from Fury UK is this new band will feature a 2nd lead guitarist so I'll be exploring my love for twin lead guitar in the great British tradition of bands like Iron Maiden & Irish rockers Thin Lizzy"
Naturally, this news will have an impact on plans for Fury UK from June onwards & they'll have more details on that soon. Meantime, they confirm the band's UK & European shows during April & May will all go ahead as planned, with Luke in place. At the same time they also want to make it clear that the announcements today do not spell the end for Fury UK. A brand new Fury UK track "Taste The Blood" will be available to fans as a free mp3 download during the next couple of weeks, with a video also put together from the recent performances at Hammerfest (N.Wales), PPM Fest (Belgium) & Roeselare (Belgium).